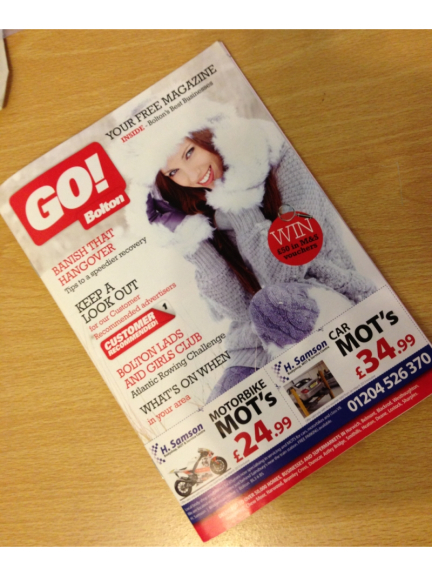 The first edition of Bolton's newest monthly magazine is now out, and copies of Go! Bolton are flying out across the area. Available in all major supermarkets, it's packed full of great local businesses, editorials and events. This months edition features some of our very own thebestof Bolton businesses. Indeed, the inside cover is taken up by Aspiration Blinds, including a great 15% Off offer. Others to feature include Danmarque (Roofing and Garages), BHE Services, Helio Fitness and Northstar Capital Consultancy. But it's much more than just advertorials, with some great editorials also featured. There is a wide selection of articles to read, including a very useful piece on how to deal with a hangover. The Atlantic Challenge in aid of the Bolton Lads & Girls Club also features.